Chateau La Dominique dates back to the 1700’s. The estate takes its name from an island in the Caribbean where the original owner earned his fortune. Today the 29 hectare vineyard consists of 23 planted hectares, of which 18 are classified as Grand Cru Classe. The vineyards are planted to 81% Merlot, 13% Cabernet Franc and 6% Cabernet Sauvignon. It is the goal of the estate to increase the portion of Cabernet Franc in the vineyards. The terroir is deep gravel over clay with some sand in the soil, similar in some parts as to what you find at Chateau Cheval Blanc, which contributes to the refined style of wine at both properties. 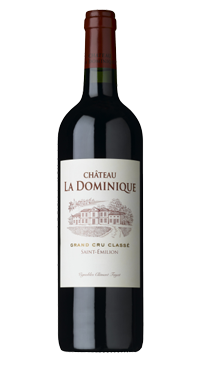 This Saint Emilion Grand Cru Classe is deep ruby red with intense aromas of ripe fruit and subtle spice. Truffle, licorice, black pepper and underbrush fill the nose. The palate offers precise tannins and a pleasing red fruit flavours on a medium to full body. This blend of Merlot, Cabernet Franc and Cabernet Sauvignon is crafted under the guidance of consulting winemaker, Michel Roland.